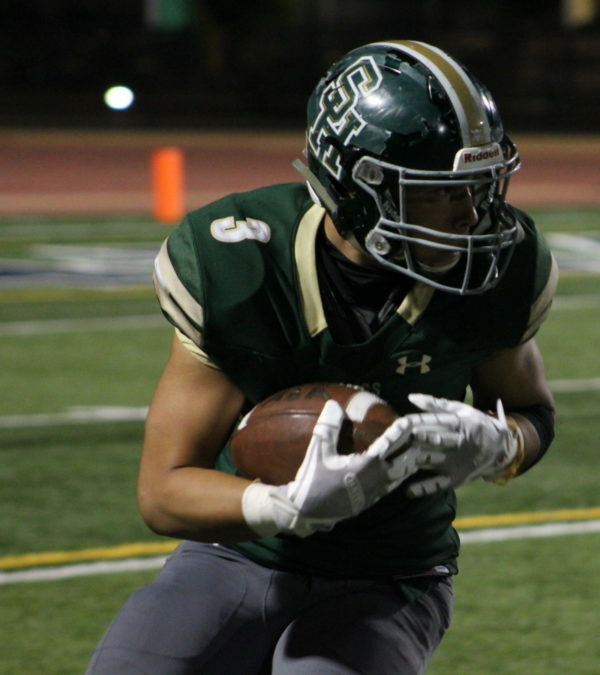 Juaquin Elliott and the South Hills Huskies host Oxnard in the Division 6 Final Saturday night. All kickoff times and dates are listed. Sierra Canyon (Gold Coast #1) at Cajon (Citrus Belt #1) at San Bernardino College, 7:30 p.m. This is a battle between two heavyweights. Sierra Canyon is a team that hasn’t lost in six weeks. It’s last defeat was to powerhouse Calabasas. The Trailblazers have rolled over such teams as Paraclete, Moorpark and Citrus Hill since. Sierra Canyon throughout the year plays a schedule that resembles murderers row. The only one that may have played a tougher schedule than the Blazers is Cajon. The Cowboys, who won the CIF Championship last season, lost just once all season, to Heritage back in September. Cajon beat Paraclete as well…76-40. The Cowboys also scored over 50 points in a game on four different occasions and the least that they scored was 36- in the loss to Heritage. They have a quarterback, Jayden Daniels, who has accounted for 72 touchdowns – 58 passing and 14 rushing – and 5,600 total yards – 4,240 passing and 1,360 rushing. Yes those are real numbers. The Trailblazers aren’t simply a good team. They’re a great team. But this year, the Cowboys are better. Cajon defends its title. Oxnard (Pacific View #1) at South Hills (Hacienda #1) at Covina District Field, 7:00 p.m.
Oxnard lost a couple of games early on but has been on a roll ever since, winning nine straight. South Hills however has won 13 straight and seems to be on a mission. The Huskies are 13-0 coming in having passed every test put in front of them so far. They have been tested a couple of time in the playoffs. Mira Cost hung around before falling 34-16 two weeks ago and they had to fight off Pacifica 20-13 last week in the semi finals, but South Hills always finds a way to win. The Huskies will find a way again. South Hills wins the title. Kaiser (Sunkist #1) at Arcadia (Pacific #1) 7:00 p.m.
Kaiser’s defense has been solid. If there was one team that could shut down the explosive Apaches it’s Kaiser. The Cats held San Dimas to six points in the second round of the playoffs and have pitched four shutouts this year. Kaiser did give up 33 however last week in a 51-33 win over Santa Ana. Arcadia is a different animal. The Apaches have a number of options that they can go to. Dylan Guerra has plenty of weapons to throw to and Arcadia can run it as well. They have a ton of speed on the edge. Arcadia hit Alta Loma for 62 last week. Offensively Kaiser will feed running back Christian Hunter who is closing in on 3,000 yards. The Cats will pound it throughout the contest. They will try to eat clock, keep Arcadia off the field and establish long drives. It might work for awhile. But the Apaches will eventually make a couple big plays on offense. They always do. They’ll pull away in the second half. 3 Comments to "Game Night: CIF Playoffs – Finals"
Nice job by Cajon taking that “L” with class. hahahaha. They showed their true colors. I’m taking Cajon too, but hasten to add that despite Downey’s impressive run to the finals last season, I took the Cowboys to beat the Vikings one year ago as well. Ouch…I think I pulled a muscle patting myself on the back. I saw the Thursday night game DR vs SH. DR had athletes all over the field but SH played sound football and won the game. SH has to play sound football again and have a few breaks and they will win this game also. Athletes win games and coaches lose games. Coach B will not lose this game.